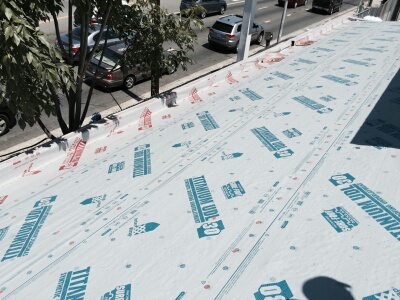 Titanium® UDL30 is a highly engineered, mechanically attached, coated, woven-synthetic underlayment for sloped roofs. UDL30’s advanced polymers allow it to be used under all types of primary roofing materials to replace #30 felt. Its grey technology provides for a cooler working surface during installations and up to a six-month ultraviolet light exposure. Unlike smooth-surfaced underlayments, UDL30 possesses a patented slip-resistant Sure-Foot® nodular walking surface technology that allows for easier steep-slope walkability, even in wet conditions. UDL30 is 20 times stronger than #30, felt and a 10-square roll weighs only 18 kg (40 lbs). This lightness combined with1220-mm (48-in) width and 76-m (250-ft) run length means big savings in time and labour (over 30% faster to install than felt). Since UDL30 is 100% synthetic, it is totally unaffected by water. This means it is inert to mould, lays flat, and will not wrinkle. It allows installers to leave their roof uncovered without the need for tarps or immediate dry-in. Unlike felts, UDL30 does not dry out or leach oils in the heat. In cold conditions it will not become stiff, difficult to roll, or crack.